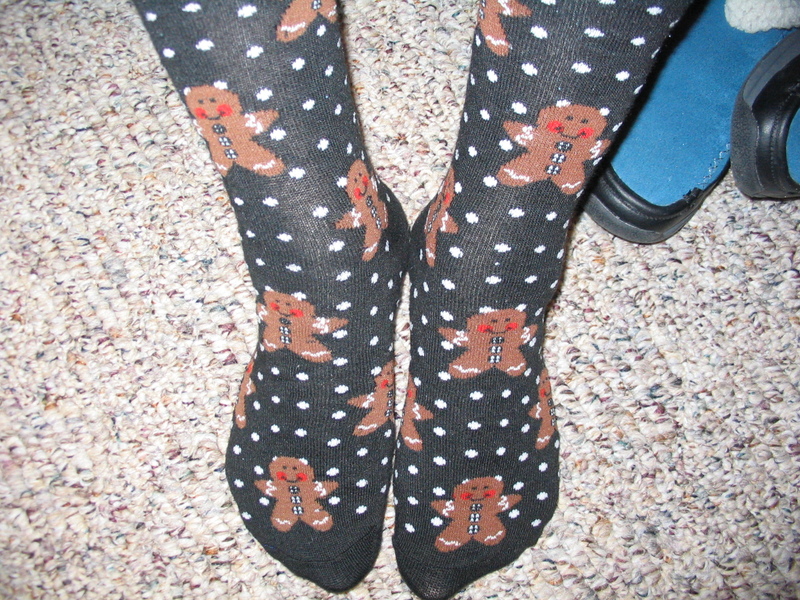 It’s not Christmas here without my homemade sugar cookies, so I put on the gingerbread men socks that I designated for baking day, enjoying the boost of good cheer that they gave me. Sadly, that cheer didn’t last long. Everything that could go wrong did. First, I used the wrong bowl for the dry ingredients and had to find a larger one. I finally located it on a high shelf, pulled it down and dropped it, breaking the large, brown, antique, salt-glazed milk bowl from my husband’s grandmother’s farm that had been nestled inside. A good cry was in order and achieved with expediency. Next, because I was still distraught, I read the recipe wrong which changed the texture of the dough. Rolling the cookies was a sticky mess, even with added flour. Finally, after baking, some of the sugar cookies broke when I took them off the pan. I’m still in mourning over the loss of my bowl, but the cookies are tasty. I might make another batch. It never hurts to have more cookies, and the next batch might turn out the way they should. So, despite today’s hardships, we have sugar cookies. Christmas is finally here. Happy Friday the 13th! Don’t walk under ladders, safe guard your mirrors, stay off the cracks if you value your mother’s back and throw that salt over your shoulder, right after you knock on wood. I’m wearing an older pair of pilled “work around the house” socks today. These feature brown and gray kitties — not a black cat in the lot (unless it’s hiding in the background). I was a fairly superstitious kid. If I think about it, most of my superstitions had to deal what would happen if I broke a routine, sort of a lesser type of OCD like Sheldon Cooper on the Big Bang Theory TV show. 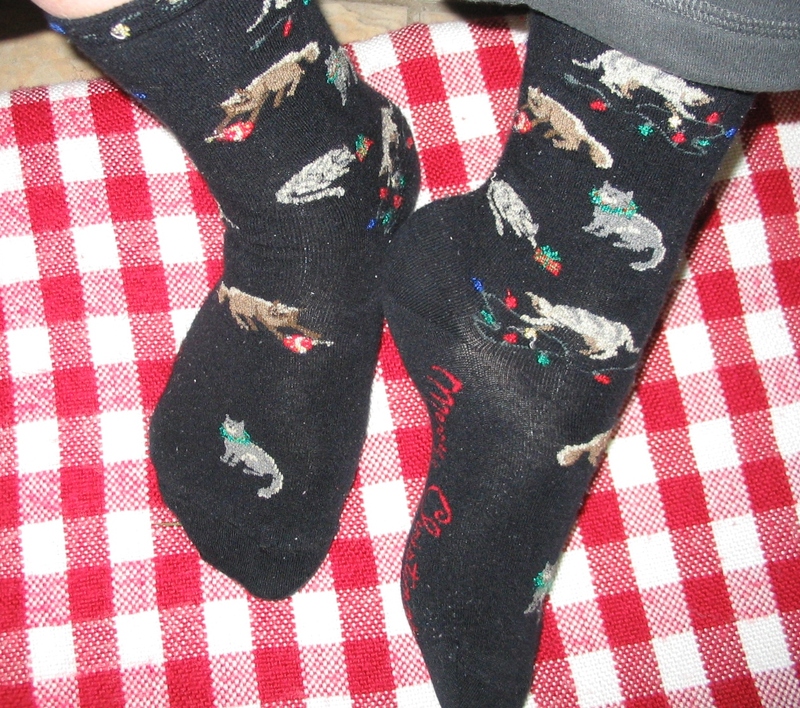 Like my socks, my former superstitions became old and worn as I grew up. In our family, we follow Christmas traditions, routines that we’ve created or that have been handed down through the families, in order to make the holidays special. That’s the difference between superstitions and traditions. Superstition safeguards personal misbeliefs. Tradition enhances community. I prefer traditions. Forget Friday the 13th and bad luck. Remember, instead, Wednesday the 25th, and the birth of our communal good fortune. Merry Christmas!